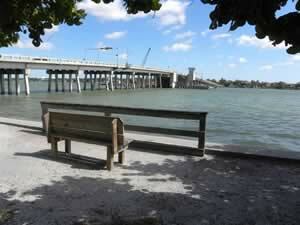 Sitting on 3 acres along Sarasota Bay Bird Key is owned by the City of Sarasota and maintained by Sarasota County. Bird Key Park offers; kayak & canoe launching, fishing, picnicking and swimming. Park entrance is about 900 feet north on Tarpon Center from above intersection. NO parking area, shoreline fishing. Restrooms, Playground, Picnicking, walking & fitness trail, fishing pier 80 feet in length. Areas in Sarasota County Florida Include; Bee Ridge, Desoto Lakes, Englewood, Fruitville, Gulf Gate Estates, Kensington Park, Lake Sarasota, Laurel, Longboat Key, Nokomis, North Port, North Sarasota, Osprey, Plantation, Ridge Wood Heights, Sarasota, Sarasota Springs, Siesta Key, South Gate Ridge, South Sarasota, South Venice, Southgate, The Meadows, Vamo Venice, Venice Gardens and Warm Mineral Springs. Areas Brackish and Saltwater in Sarasota County Florida Include; Alligator Creek, Big Sarasota Pass, Big Slough, Blackburn Bay, Curry Creek, Deer Prairie Slough, Dona Bay, Dryman Bay, Forked Creek, Gulf of Mexico, Hudson Bayou, Intracoastal Waterway, Lemon Bay, Little Sarasota Bay, Lyons Bay, Myakka River, New Pass, Phillippi River, Roberts Bay, Salt Creek, Sarasota Bay and Whitaker Bayou.